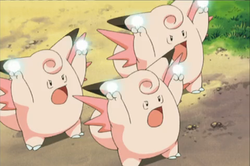 Clefable in game: 354 Who? Important notice! 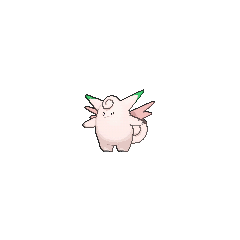 Pokemon Clefable is a fictional character of humans. 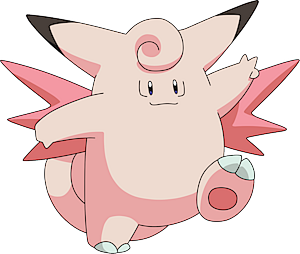 Clefable is tall, pink Pokémon with a vaguely star-shaped body. It has long, pointed ears with dark brown tips and black, oval eyes with wrinkles on either side. A curled lock of fur hangs over its forehead, much like its long, tightly curled tail. There are dark pink wings on its back, and each wing has three points. Its hands have three fingers each, and its feet have two clawed toes and dark pink soles. 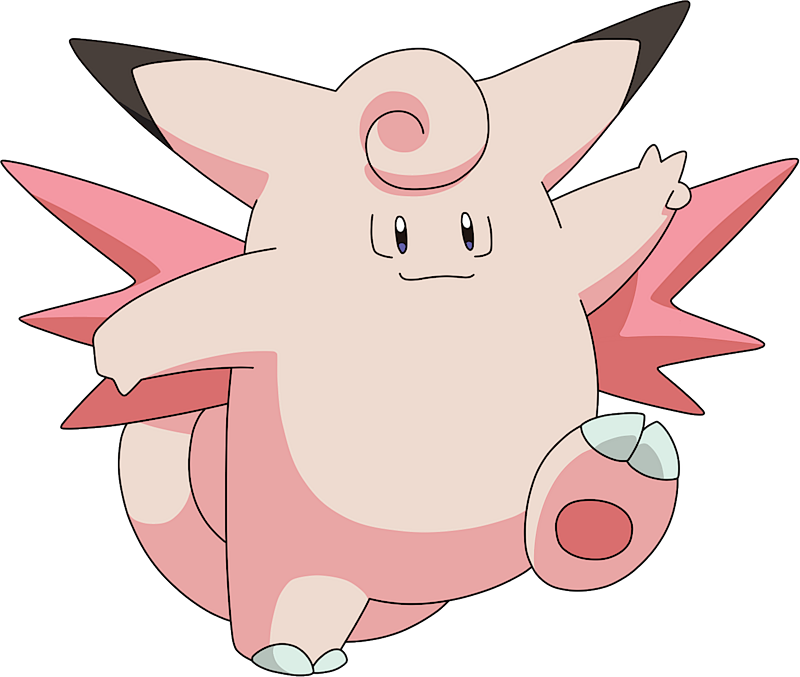 Clefable is a timid creature that flees when it senses people approaching, and is one of the world's rarest Pokémon. Its sensitive ears can distinctly hear a pin drop from half a mile (one kilometer) away. Because of its acute hearing, it prefers to live in quiet, mountainous areas of which it is protective. Using a bouncy gait, it is able to walk on water and sometimes appears to be flying using its small wings. Clefable first appeared in Clefairy and the Moon Stone. After the large group of Clefairy blasted Team Rocket away with Metronome, particles of the giant Moon Stone landed on some of the Clefairy, causing them to evolve. Clefable made an appearance for another Mt. Moon Festival in A Real Cleffa-Hanger. Clefable was also in a stage show about talking Pokémon for Stage Fight!. 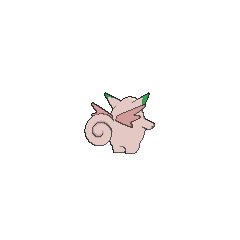 A Clefable appeared in Beauty and the Breeder, where it participated in a Pokémon breeding competition. A Clefable was briefly seen alongside a Raichu in Deceit and Assist. A Clefable owned by a Coordinator competing in the Mulberry Contest appeared in New Plot, Odd Lot!. 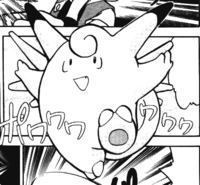 In Pokémon Adventures, Green had a Clefairy named Clefy which first appeared in A Little Kadabra'll Do It that later evolved into Clefable in The Winged Legends when Red used his Moon Stone on him. Although he was used only once for distraction against Sabrina prior to evolving, his increased power allowed him to stall Thu-Fi-Zer for a short time with his Metronome. He has since been used as a main member of her team in Green's battle against Lorelei, where he minimized himself to retrieve her miniature ice sculptures, deliberately blowing off the arm part to let the Elite Four's guard down. He has seen no major appearances since, despite always being listed as a team member. 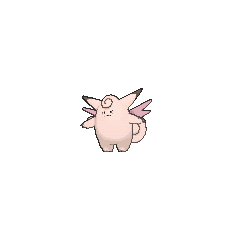 A Clefable appeared in The Last Battle XIII as one of the Pokémon sent to help the fight in Ilex Forest. 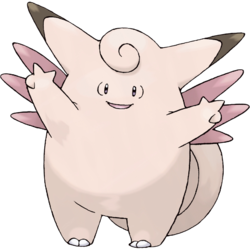 The prototype name for Clefable was Ariala.